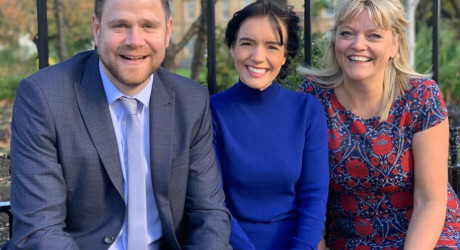 SPECIALIST communications consultancy, Perceptive Communicators, has made three appointments to its highly successful team and at the same time announces two significant award wins. The Glasgow-based company – which operates across the UK – has invested in its growth with the appointment of two PR practitioners and an accountant, in key roles to drive continued business growth and support a number of new client wins in its specialist sectors of construction, technology and life sciences. Perceptive Communicators recently picked up ‘Property Team of the Year’ at the Herald Property Awards and managing director, Julie, was awarded ‘Business Women of the Year’ (under 50 employees) at the Scottish Women’s Awards last month, highlighting the strength of the business. Joining the team as PR and social media manager is Matthew Williams with 11 years’ communications and marketing experience in various sectors, including three years with the Organising Committee for the Glasgow 2014 Commonwealth Games and Aelred Nicholas, a communications expert with over 13 years’ experience across the public and private sector. Kate McMahon is an accountant with 25 years’ experience within chartered accountancy practices, and will complement the team as she takes up the role of finance and administration manager. Julie McLachlan, managing director of Perceptive Communicators, said: “Perceptive is continuing to grow and this success is testament to our team of experts and our specialist knowledge in our key sectors of construction, life sciences and technology. “The addition of three new people to our already strong team will help support business growth. Matt, Aelred and Kate have a wealth of experience and having them on board to boost and strengthen our team even further will only lead to continued success for both ourselves and our clients. Aelred Nicholas said: “I’m delighted to be part of such a great team and feel inspired by what the business has achieved. I’m enjoying working with a range of different clients and contributing to their business growth. Having such a supportive team of colleagues is an added bonus. MEDIA RELEASE issued by Perceptive Communicators. You too can share your stories (aka press or media releases), on this site. Email here for more information.